Quarto, lego fiorini mille alla Chiesa, o al Convento dei Capuccini nella Città di Vienna, acciochè dagli interessi di quella somma eretta in fondo perpetuo si ritraggono annualmente le limosine corrispondenti a tante messe per l'anima mia, quante ne potranno ottenere dagli PP. Capuccini gli Sigri Esecutori miei Testamentari, che saranno nominati da me qui appresso. Fourth, I bequeath one thousand florins to the Church, or to the Capuchin Convent in the City of Vienna to establish a basically perpetual fund from whose annual interest the amount should be deducted to pay for the number of masses for my soul that the executors of my will (who will be appointed by me below) will agree upon with the Capuchin Friars. Tesi Tramontini died on 9 May 1775. 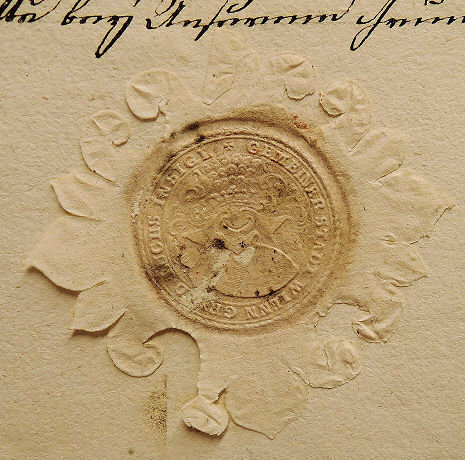 On 13 November 1776 the auditor of the court submitted a report to the City Council which consisted of a list of Tesi's assets and a summary of her testamentary dispositions. 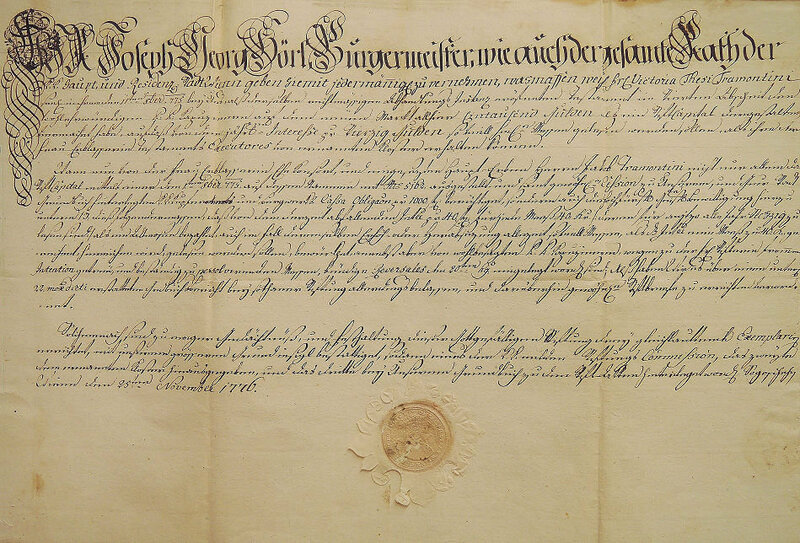 Tesi's Mass endowment led to the drawing up of three copies of a so-called "Stiftbrief" (endowment deed) which was basically an official announcement, issued by the Mayor of the City of Vienna Joseph Georg Hörl and the Vienna City Council. I recently was able to locate one of the three copies of this document in the holdings of Vienna's Municipal and Provincial Archives and herewith publish it as an addendum to my Tesi article. 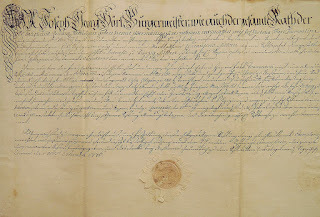 The deed concerning Tesi Tramontini's Mass endowment (A-Wsa, Sonderregistraturen, Stiftungen, A4/7423). This is the copy which was deposited among the files of the municipal cadastral registry. Wir Joseph Georg Hörl, Bürgermeister, wie auch der gesamte Rath der K.K. Haupt, und Residenz-Stadt Wienn geben hiemit jedermannigl[ich] zu vernehmen, wasmassen weil:[and] Fr. Victoria Thesi Tramontini seel. [ig] in ihrem den 11ten 8ber. 775 beÿ Uns, alß derselben rechtmässigen Abhandlungs Instanz eröfneten Testament im Vierten Abschnit den wohlehrwürdigen P:P: Kapuzinern auf dem neuen Markt allhier Eintausend Gulden als ein StiftCapital dergestalten vermachet habe, aufdaß von dem jährl[ich]en Interesse pr Vierzig Gulden so viell heil[ig]e Messen gelesen werden sollen, als ihre der Frau Erblasserin Testaments Executores von ernannten Kloster erhalten können. Wann nun von der Frau Erblasserin Ehe Konsort, und eingesezten Haupt-Erben Herrn Jakob Tramontini nicht nur allein das StiftCapital mittels einer den 1ten 8ber 775 - auf dessen Namen mit N:o 5162: ausgestellt - und samt gewöhnl:[ich]er Cession zu Unserem, und Ge[mein]er Stadt Grundbuch hinterlegten K:K: Kupfer Amts und Bergwerks Cassa Obliga[ti]on pr 1000. f: berichtiget, sondern auch die hoch fürstl[ich] Geistl[iche] Bewilligung hierzu unterm 13: dieß folgendermassen, daß von dem derzeit abfallenden Inte[ress]e pr 40 f: für jede Meeß 40: Xr |: deren für anj[e]tzo alle Jahr Sechzig zu lesen sind :| als ein Allmosen bezahlet, auch im Fall derenselber Erhöh- oder Herabsezung allezeit soviell Messen, als d[a]s Inte[ress]e eine Meeß zu 40: Xr gerechnet, hinreichen wird, gelesen werden sollen, bewürkhet, annebst aber von wohlbesagten P:P: Kapuzinern, wegen zu der Fr: Stifterin frommen Intention getreü, und beständig zu persolvirenden Messen, bündige Reversales den 20ten h[ui]us eingeleget word[en] sind; Alß haben Wir es über einen unter[m] 22: mox dicti erstatteten Gr[un]dbuchsbericht beÿ sothaner Stiftung allerdings belassen, und darüberhin gewöhn[lich]e Stiftbriefe zu errichten verordnet. Solchemnach sind zu ewiger Gedächtnüß, und Festhaltung dieser Gottgefälligen Stiftung dreÿ gleichlauttende Exemplari[en] errichtet, mit unserem grösseren Grundinsigl bestättiget, sodann eines der K.K: milden Stiftungs Commisssion, das zweÿte dem ernannten Kloster hinausgegeben, und das dritte beÿ Unserem Grundbuch zu den Stift-Akten hinterleget word[en]. So gescheh[en] Wienn den 25ten November 1776. We, the Mayor Joseph Georg Hörl, as well as the whole City Council of the I. 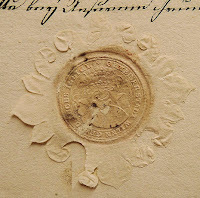 & R. Capital of Vienna, herewith inform everybody that the late Ms. Victoria Tesi Tramontini, in the fourth paragraph of her will, which on October 11th, 1775 was published in our presence, as her legitimate probate court, bequeathed an endowment of one thousend florins to the honorable Capuchin Convent here on the Neuer Markt, so that the annual interest of forty florins will be used to have the number of Masses read which the executors of the bequeather can receive from the aforesaid convent. As soon as the bequeather's husband and appointed universal heir Mr. Jakob Tramontini not only deposits the endowment fund in form of a copper office and mining share – numbered 5162 and issued on October 1st, 1775 under his name – together with a regular cession to our municipal land register, but also on the 13th of this month received the prince-archbishop's permission in such a way that from the current annual interest of 40 florins with each Mass costing 40 kreuzer (of which sixty have to be read every year for the time being), alms will be paid, and also in case of an increase or a decrease of the price there will always be the number of Masses read which is covered by the annual interest of 40 florins, counting 40 kreuzer for each Mass. Furthermore, on the 20th of this month, a binding commitment was submitted by the Capuchin Convent concerning the Masses that have to be read faithfully and perennially according to the intention of the benefactress. Thus, by means of a report from the cadastral registry, dated the 22nd of the below-mentioned month, we have indeed kept this endowment unchanged and we have ordered three ordinary endowment deeds to be drawn up. Hence, to the eternal memory and to the establishment of this godly endowment, three identical copies were drawn up and certified with our bigger cadastral seal, of which one was given to the I. & R. Commission for Charitable Endowments, the second to the aforesaid convent and the third was deposited among the endowment files in our cadastral registry. Thusly come to pass, Vienna, November 25th, 1776. Tesi Tramontini's Mass endowment remained valid until 1811, when the sovereign default of the Austrian Monarchy reduced the value of the mining share, which secured Tesi's endowment, to about 200 florins. According to information I received from the Capuchin Convent, after the state bankruptcy the reading of Masses for Tesi Tramontini was not continued. Tesi's burial site, the old Capuchin crypt, which is located right below the church, was continually sized down as the Imperial Crypt needed to be enlarged. In 2003, on the occasion of the beatification of Marco d'Aviano (one of the most prominent Capuchin friars) the old crypt was opened and it was discovered that the skelettal remains of the people buried there before 1784 have already been piled up into a large rectangular base on which d'Aviano's coffin is resting. © Dr. Michael Lorenz 2016. All rights reserved. Nichts auf (oder unter) Erden dauert ewig.